Spanish-language debate team members Megan Boyd and Yessenia Sanchez finished as finalists at the Campeonato Mundial Universitario de Debate en Español (CMUDE). Throughout the 10-day competition, Boyd, a biology senior from Lake Forest, Calif., and Sanchez, a business senior from Hollister, Calif., competed with approximately 300 other participants from around the world. The two students argued their way to the final round in the Spanish as a Foreign Language category, competing against world-class teams from Venezuela, Mexico, Chile, Colombia, Ecuador, Spain and Guatemala, among others. 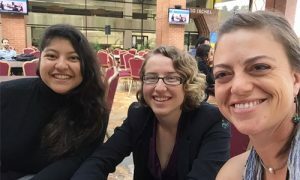 “Boyd’s and Sanchez’s groundbreaking success in the CMUDE represents the expansion of the Cal Poly debate team into the Spanish language world of debate,” said Marion Hart, Cal Poly Spanish-language team coach and a professor in the World Languages and Cultures (WLC) Department. “It extends Cal Poly’s historic recognition in the national and international worlds of competitive academic debate,” added Christopher Skiles, director of forensics at Cal Poly.